Today, we take a closer look at the top 19 brands of acrylic paint that are most frequently used by artists around the world. Acrylic paints are one of the most popular media among artists of all skill levels and backgrounds because of their versatility. They can be thinned to achieve the same effect as watercolour or applied in thick layers to create the appearance of oil. They tend to dry rather quickly, eliminating the need to wait between layers. However, retarders can also be added to slow down the dry time for artists who prefer the wet on wet technique. Additionally, acrylics can be painted on a variety of supports, including canvas, paper, metal and wood. There is a wide range of acrylic paints available, both for professional artists and for students. With so many options, how does an artist choose? Most experts recommend buying several brands and performing your own experiments to decide on a favourite, but we know that trial and error can be expensive and time-consuming. As an artist, your primary focus should be on the creative process, not product testing! After searching for a guide online and finding that almost all of the blogs and articles comparing acrylic brands have been written from the perspective of only one person, we decided to make our own comprehensive overview. We analysed consumer reviews from a number of online merchants and surveyed thousands of artists who showcase their work on WonderStreet. We then combined this feedback to form a general consensus about each brand. A summary of our conclusions is listed below. Please keep in mind that a “pro” for one brand may be a “con” for you (or vice versa), depending on your skill level and personal style of painting. Also, it’s worth noting that the order in which we present each brand is not indicative of any kind of rating system. However, we have included a shortlist of our favourites in the “final thoughts” section at the end of this post. We decided to divide the brands into two separate categories: professional and student grade. This is because the grade of the paint has an obvious impact on the price, pigment load and overall quality. In the first section, we compare brands that should be used by more experienced and professional artists. In the second section, we’ll look at 5 brands that are most popular with students. There seems to be some debate over the issue of packaging when it comes to tubes of acrylic paint. Though many artists prefer the look of metal to plastic and commented that it’s much easier to get all of the paint out of a metal tube, others suggested that metal is more susceptible to corrosion, particularly in humid climates. Winsor & Newton Artist’s Acrylics come in a metal tube that was praised for not clogging, but criticized for having a cap that is too small and difficult to remove. Despite these small flaws, the brand clearly has a significant number of loyal fans. Our artists reviewed four different products from the Golden Artist Acrylics product line with varying consistencies: from Heavy Body to High Flow. Though it’s one of the more expensive brands available, several from our community noted that they were able to stretch the paint much further than other brands. We also heard a lot of good feedback about the company's well-staffed team of Materials and Applications Specialists who are always there to reply any questions you might have. Others were positive about the packaging as they provide an actual paint stripe on each tube and a chart for each color's characteristic and performance with regards to opacity, viscosity, gloss and tinting. As a heavy body acrylic, one would expect Golden Artist Colors Heavy Body Acrylics to have a very thick, oily texture. However, this was the only brand where some artists complained that the consistency was actually too buttery. If you prefer to paint with a more fluid acrylic medium, Golden's Heavy Body Acrylics is not the product for you and you might want to consider some of the other options from Golden's line of acrylics (see below). Artists who prefer the thicker texture were pleased by the extra “sparkle” that their finished products had. Golden’s Open line is the perfect paint for those who want to transition from oil to acrylic. Because it has a much slower drying time, the artist has the opportunity to work and re-work the paint, much like one would in an oil piece. This brand is not for the artist who wants a dry support in a matter of minutes or even hours. Some complained that their canvases remained tacky even after days of drying. Golden offers a wide range of mediums that can be added to change the consistency of the paint. Water can also be used. If you love Golden products, but need a thinner paint for your work, Fluid Golden Acrylic might be an excellent choice for you. Though some of those surveyed did not really appreciate the liquidity, we heard time and time again that the consistency had no effect on the pigment load of this product, which is exceedingly high. Sure, you could add medium or water to a more heavy body acrylic paint to achieve a thinner effect, but why would you want to do that and compromise the color when Golden makes the High Flow Acrylic? Several of our reviewers said that this product is very much like ink or spray paint and that it supports a variety of different styles without compromising quality. Several artists from our community said that Liquitex Professional Acrylics are easy to remove from hands and clothing, which may be ideal for the messy painter. 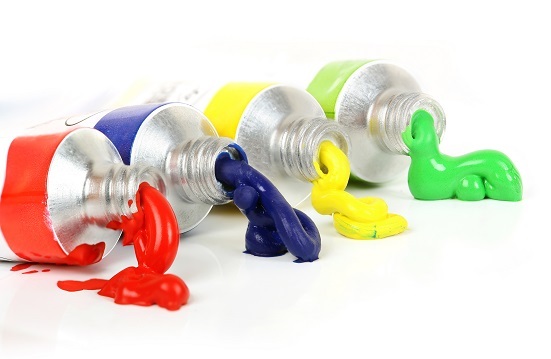 However, we have also heard that some believed it to have a strong chemical odour, possibly due to the fact that it seems to have more filler than other professional grade acrylic paints. The plastic tubes can be closed and re-opened several years later without any degradation of the paint and several artists were pleased with the assortment of unusual colours, which cuts down on mixing time. What sets Sennelier Abstract Acrylics apart from the rest is their very unique packaging. Instead of tubes or jars, this paint comes in squeezable plastic pouches. The plastic is transparent, which makes it easy to see exactly which colour you’re going to get, and it’s also quite easy to handle. Some artists said that they were able to easily apply the paint directly to the canvas from the package, which is great for heavy impasto work. Others found the pouches awkward to store and noted that it dries very quickly if a retarder is not added. M. Graham & Co. Acrylics was praised all-round for its pigment load and some liked that it works very well together with water colours. Graham Acrylics dry slowly and it allows the surface to be reactivated up to an hour after application by re-wetting it with water. One big complaint about this product was that it could be difficult to find in stores – particularly the opaque range of colours. If you are not a frequent painter, you may have some issues with Old Holland, as several of our artists mentioned that the paints dry out quickly in the tube. At a higher price point, this can be frustrating for you and your wallet. However, many were pleased by the high pigment load and the workability of this product. This is another brand that we would recommend for the artist transitioning from oil to acrylic, but perhaps not for the experienced acrylic painter. Chroma Atelier Interactive Acrylics are interesting because they can be unlocked by spraying the paint with water or a special type of medium, which allows the artist to go back in and re-work certain sections of the painting. This would be great if you prefer to have the option of choosing between a slow and fast drying time. However, we did find that many people were frustrated by the unlocking technique and did not feel that it was worth the time to learn it. Matisse Structure Formula Acrylics are produced in Australia and they have a very unique range of colours that reflect the palette of the Australian Outback. Many artists considered them to be their favourite brand, but noted that they are not easy to find in stores. These are heavy body acrylics, which are ideal for creating texturized pieces. We heard complaints regarding the packaging of this product, which does not flow well from its plastic tube and appears to have some consistency issues. Unfortunately, it also does not mix well with water or other mediums. However, most painters share the general opinion that the colours are vibrant and true. Out of the 19 brands that we surveyed, Utrecht seems to have the most loyal following. Many of our artists have used this brand exclusively for 20+ years, which is definitely a testament to their overall reliability. Though it does not mix well with other brands of paint, it does mix easily with water and Utrecht’s excellent line of mediums to achieve a variety of effects. TriArt offers both liquid and Heavy Body Acrylic Paint. The liquid version is highly recommended for the artist who is looking for a somewhat thinner acrylic paint. Many of our artists noted that it spreads well across the support. Others said that it was too thin for their taste and that it has a tendency to lose opacity. Several from our community struggled with broken plastic caps on the liquid version. The TriArt Heavy Body Acrylics was praised a lot for its high pigment load and great texture, while others liked the reusable jars as well. Lascaux Artist Acrylics appear to have a solid, but unremarkable reputation with a very limited number of diehard fans. However, artists were generally pleased with the product’s results. It was noted that Lascaux Artist Acrylics do not have a particularly long shelf life, so this would not be the best choice for the occasional hobbyist painter. There also seems to be some general disappointment regarding the variety of sizes and colours that are available. If you happen to find Maimeri Brera’s line of acrylic paints, it may be worth picking up one or two tubes of this very reliable product. It meets all of the necessary requirements for a high-quality acrylic medium, including intense pigmentation, versatility and a pleasing, creamy consistency. However, the product, which is produced in Italy, can be very difficult to find in stores. While the brands listed below are ideal for beginners because of their lower price and generally slower drying time, they would likely be disappointing for an experienced acrylic artist who is used to a higher quality of paint. Daler-Rowney Graduate Acrylics is non-toxic and boasts quite a high pigment load for a student grade acrylic. It is also quite cheap and can withstand some rough treatment. It will not crack even if the support is rolled. This brand would not fare well with intermediate to professional level artists because of its inferior texture, which several reported to be very much like plastic. Liquitex Basics is another brand that we would recommend only for beginners, particularly those who are interested in achieving a watercolour effect in their work. This product is particularly thin and many painters reported issues with its opacity. There were also some concerns about the packaging. Several people received tubes that were filled with dried out or rubbery paint. Because it can be applied to a wide range of surfaces, it is not a bad product to keep around for small household projects. It also cleans from hands and clothing quite easily. Of the five brands of student grade paint that we have included in this list, Blick’s house brand seems to be of the highest quality. We found many instances of it being used as an inexpensive base layer by more experienced artists. It also appears to be a favourite for art teachers. It does dry faster than most student grade brands, which makes it more suitable for the intermediate-level painter. This is another brand that would be better suited to an intermediate-level painter rather than a beginner, because of its faster drying time. Grumbacher’s paint is also more on the thin side, which means that it cannot be used for heavy textural work unless it is mixed with a thickening medium. It is quite low in price and the colours are more true than other student grade acrylics. Winsor & Newton’s Galeria Flow line is great for the student looking for an acrylic that does not utilize any animal products. It is 100% vegan, it flows nicely from the tube and on the support and there are many sizes available. However, the consistency was described by one online reviewer as “tinted whipped cream,” and the pigment load is as low as one would expect from a lower end student grade acrylic. Though it’s difficult to definitively say which brand of acrylic paint is the best as it really depends on the personal taste of the artist, we received the most positive feedback for Utrecht Acrylics. Artists of every style and background appreciate its versatility and found the quality high enough to remain loyal to the brand for many years. Golden Artist Colors Heavy Body Acrylics and Sennelier Abstract Acrylics receive an honourable mention, particularly for the artist who likes their acrylics to have a rich, buttery texture. Painters who prefer a thinner, more watercolour-style paint would be happy with TriArt Liquid Acrylics. For the beginner, we recommend Blick Studios Acrylics , which are a reasonably priced alternative to the professional grades of acrylic paint that don’t sacrifice too much with regards to pigment load and consistency. What’s your favourite acrylic paint brand? We’d love to hear your feedback... Please leave your comments below. WonderStreet is an invite-only community where artists connect with customers. Sign up and showcase your acrylic paintings. It's free and only takes a minute! Which Easel Style is the Best for You? Acrylic paintings on WonderStreet posted by artists like Kerry Darlington and many others.